What I love about my hometown Englewood, New Jersey and the neighboring towns is the tree lined streets and exquisite attention to parks. This park used to be private property with a gorgeous estate upon it. Now only the stone base of the home exists. I love the regal lion sculptures who greet you as you walk into the house's original entry way while there's a lion in the distance on guard as well. Seeing the home's foundation still standing strong along with the lions as gate keepers allows one's imagination to wonder what living here must have been like. As a teen I used to go to this park to sulk, chill and admire the flowers. I read way back in some fairy tale as a child that the fairies in the flowers throw you "Glamours" each time you gaze upon them. "Glamours" are beauty spells that makes everything look better than it usually appears. For a long time I thought if I spent more time looking into flowers it would make everything better. Amongst friends as a teen I always won who had the longest tongue contest. ﻿﻿﻿﻿﻿﻿﻿Now I'm not whining or being airy fairy in the park. Instead I'm exhaling in lion's breath while my hands are interlaced behind me creating a gentle heart opening back bend. You can't hear my roar. I'll assure you, today its a fierce one. Sticking your tongue out on an exhale and roaring is a great tension tamer. Try it. I'm sure there must be some stress within you that can use a little unleashing. If you have or haven't been following my blog posting I've been sharing that I've been experiencing a lot of emotional healing in regards to many areas of my life these days. In fact it feels like a roller coaster. One thing after another. I've also been noticing as I drive my car and look out the window it seems as though everything I pass by is moving forward with me. This must be what the books I read about a year or two ago meant by everything will accelerate as we get closer to the end of the Mayan calender, 2012. I rarely get into the specifics of my pain and suffering because frankly it is endless. Isn't it true for you too? We all have a story line don't we? Isn't it part of the human menu? I don't believe you really need to know about the skeletons in my closet. Do you? Now that I think about it, isn't this why reading tabloids is so popular? There's some sort of twisted satisfaction in knowing that the modern day flawless on the outside Gods and Goddesses of the silver screen experience internal mortal everyday pain and suffering . I'm wearing blue & green on the hottest of summer days because they are cooling colors. I do believe the tabloids are threaded with untruths. They exhibit eye catching as well as silly pictures and stories. On the bright side of the trash magazine trade, from a healing perspective, more than once I've experienced reading a flashy headline which triggered my feeling center so deeply that my worst fear has been pulled out of the bottom of my heart and brought to the surface to feel and work towards healing. Imagine, all this emotional turmoil simply by waiting on a supermarket's check out line while glancing at some cheap magazines. This mermaid look skirt is vintage and bought in London from a company named Peruna. It's powerful when our heart opens up. Feelings are felt, a healing can occur and new doors can open if we release a layer of our pain and then do it again when we get triggered to feel it again. Before the heavenly gates with regal lions on each side can open up and let us into our paradise there's a whole slew of processing that needs to go on in between feeling your feelings and healing. Shelf bra camisole top, Strawberry Shop $4.99. I inserted foam cups within the bra's shelf for a smoother look. The word processed reminds me of getting my hair colored, most fast foods, fruit punch or a pop tart. Yes, it takes a bunch of dye, chemicals and in some cases a little food to make what we usually refer to as processed. When it comes to our healing I'm referring to developing a little check list you can put into your emotional tool box to assist you. When you get triggered to feel pain actively fight your mind from talking you out of feeling it. Becoming numb is a cop out. If this doesn't sell you on working on your personal self healing now, I can assure you if you don't heal what is showing up for you time and time again, do know it will never go away. As I prepare to go into Warrior 1, I encourage my back leg's hip slightly forward and up. When you feel pain which can take the form of dishonor, abandonment, anger which is the same as fear, jealousy, attachment (the same as greed), desire...whatever pain means to your feeling center not your mind...label your pain. If it is anger, say it to yourself and feel it. Notice if you can identify where this emotional pain resides in your physical body and then take a deep inhale. I'm practicing Warrior 1 because it has a heart opening back bend which mixes nicely with my emotional healing. ﻿﻿﻿Visualize your inhale bringing space, light and guidance into your physical and energetic body. As you exhale see this pain loosing a layer. Similar to what it would look like if one layer of paint chipped off a wall. Continue this exercise by taking another deep inhale, feel your pain and acknowledge where it is stored in your body. Exhale release and see a few more chips of suffering fall towards the earth. Interlacing my hands in yoga mudra creates more of an upper chest & shoulder opening. Once more take a deep inhale, feel your stuff along with the infected body part. Maybe it is your reproductive body, tight shoulders, a bad knee or a weak lower back. Visualize fresh blood and oxygen moving through you. As you exhale see your physical ailment becoming less chronic as your mental body becomes more expansive like a perfect blue sky on a sunny day while at the same time having laser pin point clarity. My upper chest is full from my inhale, keeping me buoyant, as I transition into a front bent knee and onto the ball of my back foot with an exhale. Three ultra conscious emotional healing breaths can be done anywhere. At the bottom of my exhale I tighten my waistline and find flight as I continue to breathe in and out in Warrior 3. All it takes is a little awareness and plenty of daily practice. Bring your finger tips under your shoulders as you lengthen your heart forward & gaze like a bird in a tree, looking forward & down at us silly humans. Nose dive down to kiss your knee as you slightly open your extended leg's hip. From here I would move into a seated spinal twist. These pictures were taken after I taught a yoga class. The outfit shown is my yoga cover up. Underneath my skirt I'm wearing black shorty tights. In summers past I would only wear capri tights during summer's heat. This season I'm digging deep and I'm working on myself. I gave away my capris and bought short tights to work on feeling the pain that comes up for me as I gaze in between my mushy thighs in downward facing dog. You see, you can find a way to heal just about everything if you take a moment to realize where your pain is coming from. I'll give you a hint, my pain is not coming from my jelly thighs. Cleaning up my diet and developing a stricter exercise regimen never worked on making my thighs less dimply nor can I blame my parents for inheriting their legs. Our thighs don't look related. The pain that wells up for me as I gaze at my fleshy thighs is coming from my mind and all it's looping mind patterns. What do you see in the lion's roar? Fear, beauty, grace, strength, courage, love? Have you ever had to speak up or break up with someone in either a personal or professional relationship? Perhaps you're experiencing a time when there's nothing you can do but surrender and internally scream. When you begin to experience the process of going towards your emotions, rather than blaming another and being a victim to your circumstance then your emotions are no longer coming towards you. Instead you begin your spiritual journey and a sense of dancing with your life in good, neutral and difficult times begins. In the third turning of the wheel of dharma, the Buddha speaks of the lion's roar. 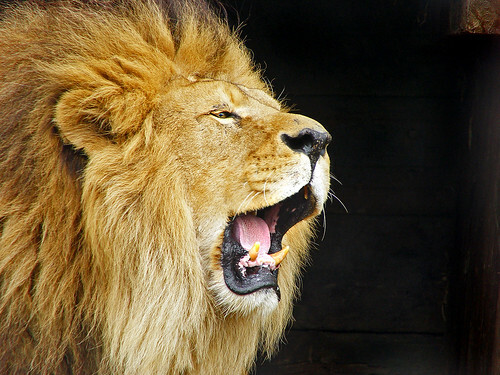 The lion's roar is the fearless statement that anything that happens in our state of mind, including our wild emotions is like manure that can be weeded, receive new seeds and grow. When we roar, it is a reminder to go deeper into our practice. On Saturday July 23 @ 3:30pm for 2 hours I will guide us through a back bending yoga flow practice where we will use innovative yoga therapy techniques and summer's natural heat and humidity to help loosen our tight neck and shoulders. Employing equal parts of precision and genntlenes, we will crack open our heart energy center along with understand how the lion's roar can accelerate healing our emotional body and lead us to our next stage of learning and growing. Visit my Bamboo Moves Yoga blog at http://www.bamboomovesenglewood.com/ & Click on the orange B and read about Beginner's Ayurveda and how to beat the summer heat naturally.